Ultimate Tag Warrior is pretty much obsolete (at least if your using the latest WordPress version). However, if you used to use UTW, and have since migrated to another tagging system such as the WordPress default tagging system or Simple Tags, you may want to completely remove the old Ultimate Tag Warrior tagging structure from your database to save some space and reduce clutter. I prefer to use a nice little database management plugin for WordPress. 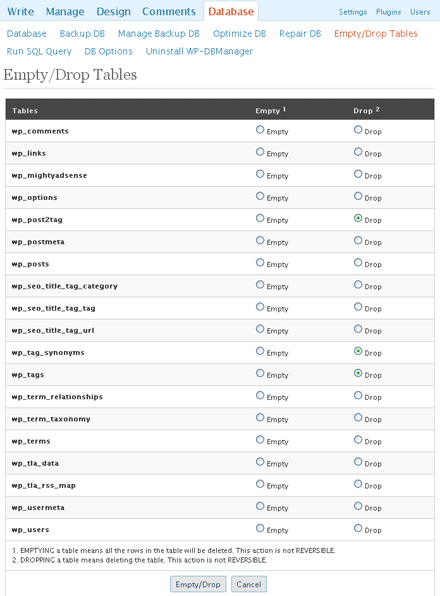 It allows me to manage my database from within the WordPress admin panel. You can download it HERE. Once you have the plugin installed. Proceed as follows.